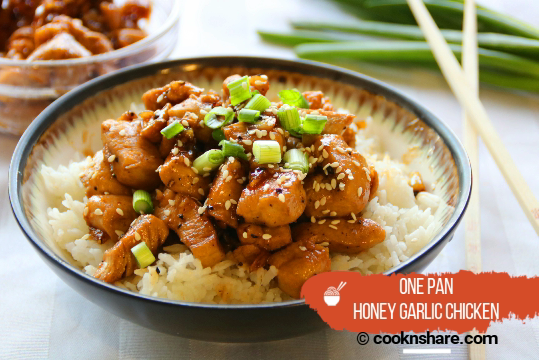 Honey garlic chicken is so simple and delicious. The recipe originated in China, and made its way into kitchens around the world. The wonderful thing about this recipe is, the entire dish can be made up in 30 minutes which makes it a superb midweek meal. Most of the ingredients you’ll have right in your pantry, as well. I have to say that it doesn’t get much easier. As with many of our recipes in this site, it can be altered in a number of ways. To begin with, if you don’t have honey or not fond of it, you can use corn syrup or granulated sugar. I find a really good quality honey works best though. As with any herb or spice, fresh garlic is the best, but garlic powder or salt can be substituted . If you want to add extra spices such as onion powder or anything like that, feel free to do so. I always use boneless, skinless chicken breasts as they are healthier and easier to work with, but any cut of chicken can be used. Pour some oil into a preheated pan and place the chicken in. Pepper it to taste, stir and fry it, over medium high heat, until it slightly browns. This should take four of five minutes. Add in the chopped garlic and saute it, for about 1 minutes, until it's fragrant. Pour in the water, soy sauce, and honey. Toss until the chicken is completely coated. Serve over steamed rice garnished with the green onions and sesame seeds. Enjoy your 30 minute, one pan, honey garlic chicken.